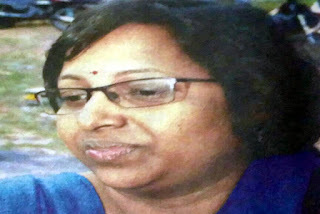 Sashmita Ghosh, the former district child protection officer of Jalpaiguri, was arrested today by the Criminal Investigation Department in connection with the illegal sale of babies from an orphanage run by an NGO in Jalpaiguri town. The arrest comes within 24 hours of Sashmita being suspended by Rachna Bhagat, the district magistrate of Jalpaiguri. Mrinal Ghosh, her husband and the DCPO of Darjeeling, who is also under suspension, was arrested two days ago by sleuths for his alleged involvement in the case. This morning, a CID team went to Collegepara and raided the couple's residence. Sources said some important documents had been seized. "We have evidence that Sashmita has concealed information and did not deliver her official responsibility as the DCPO of Jalpaiguri. She was supposed to have clear and updated information about the children staying at the orphanage. In case any child is provided for adoption or shifted somewhere, she should have that information as well," an investigator said. She couldn't, however, satisfy the CID officials when asked about the children whom Chandana Chakraborty, the main accused, had illegally sold. "Sashmita has also misused her power. There is proof that without informing the Child Welfare Committee of Jalpaiguri, she has put her signature, allowing the NGO to shift children from the home or in other words, let them sell the children against cash," a source said. Earlier, the CID had clarified that Mrinal was aware of the illegal selling of infants by Chandana, who heads North Bengal People's Development Centre, the NGO. The investigators have also found that Mrinal had influenced Debasish Chanda, a doctor associated with the orphanage, to prepare fake documents of around 17 infants whom Chandana had illegally sold in the past three-four years. "Our team has visited the residence of Mrinal and Sashmita. There, they have found some more documents which have only substantiated our doubts. We are also checking out their bank transactions as there are reports that both have received benefits from Chandana," an official said. CID officials further said they had also got names of people whom Juhee Chowdhury - the woman leader of BJP arrested in this case - had contacted in Delhi. "We have got a number of names and are in the process of carrying out the verification of corresponding call records to know what their roles were in this case. In due course, we would also start the process of calling them to obtain information," the source said.